Every time I go back to France to visit my family, I always spend a few days in the “city of lights”. But Paris is so much more than just its colloquial reference. It’s the music in the streets, the monuments, the museums, the cabarets, the farmers markets that go for miles, the people and of course my favorite, the quintessential Parisian “bistro”. It’s nothing fancy but it is the best way to soak in all that French “je-ne-sais-quoi” that we all adore. Here I am, sitting on the terrace of a local bistro, gazing at the scenery and practicing the upmost Parisian sport : people watching. After a couple of minutes, the “garçon” dressed with his conventional black attire and equipped with his round serving tray, walks towards me and bluntly takes my order. I simply say – “Un petit café s’il vous plait!” … and so it goes. When in Paris, I rarely take public transportation. Mostly because I like to walk, meet people, and discover little gems along the way. 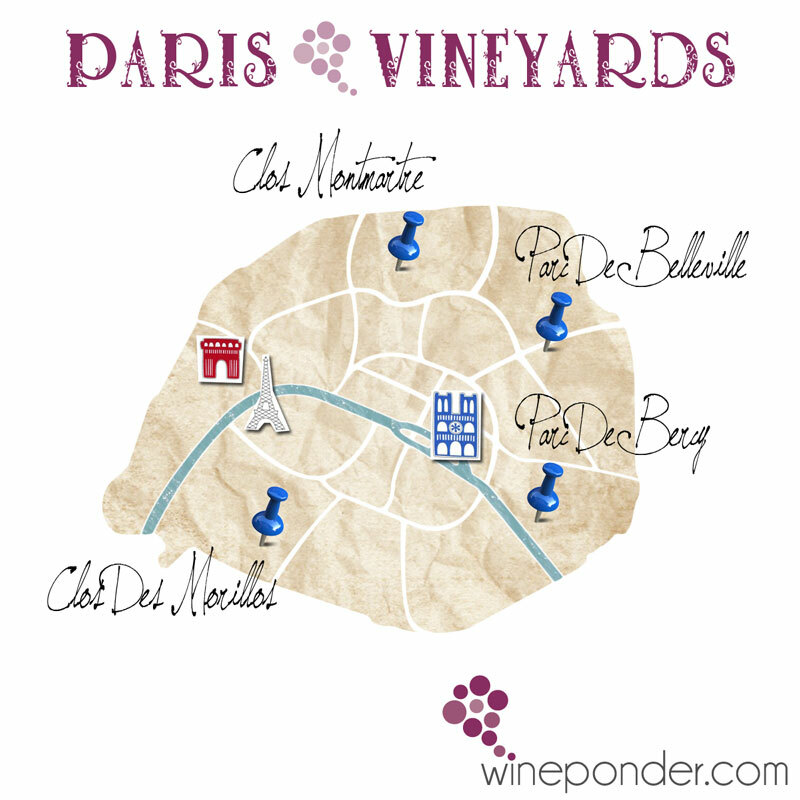 Point in fact, I probably would have never known about a tiny little vineyard in the heart of the Montmartre district called “Clos Montmartre”. Montmartre is a hill (about 130 meters high) in the north of Paris (18th arrondissement). The district is primarily known for the white-domed basilica of the Sacré Cœur on its summit, for its intense nightlife and cabarets (Moulin Rouge), and for the arts. Many artists had studios or worked in or around Montmartre, including Salvador Dalí, Amedeo Modigliani, Claude Monet, Piet Mondrian, Pablo Picasso and Vincent van Gogh. And then, there’s the vineyard! 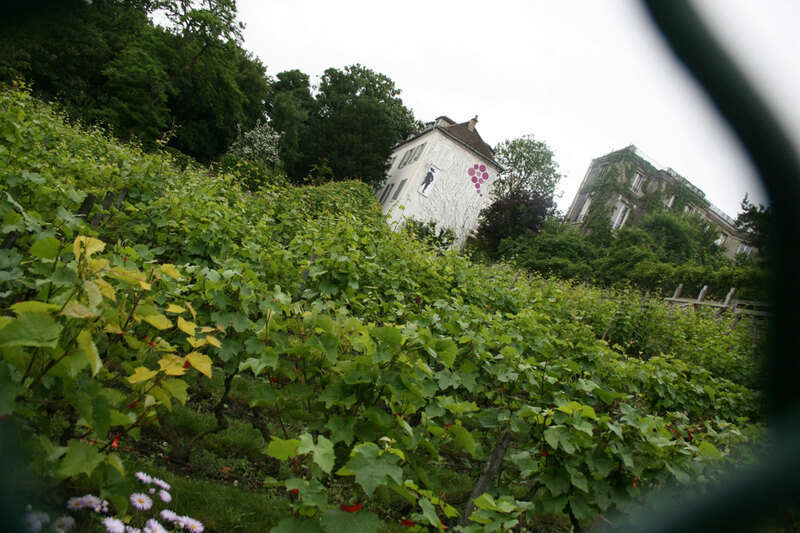 The vineyard of Montmartre is a fascinating story, and it all started in the 12th century. By the 17th century, the hill of Montmartre was just about covered by vineyards and the wine triggered the construction of various taverns and cabarets (called “guinguettes” in French). 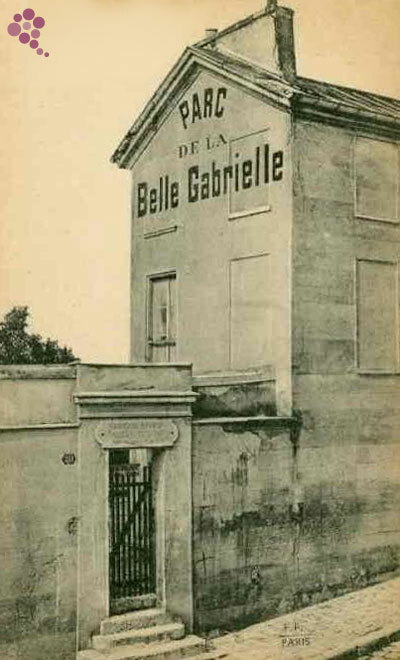 The most renowned was called “Le Parc de La Belle Gabrielle” whose owner was Gabrielle d’Estrées, King Henri IV’s mistress. Oh la la! Sadly, the site was abandoned and lost most of its appeal as years went by. It became a grim location for homeless people and a playground for the local kids. Once Montmartre was added to the city of Paris in 1860, residential buildings were built in place of the vineyards. 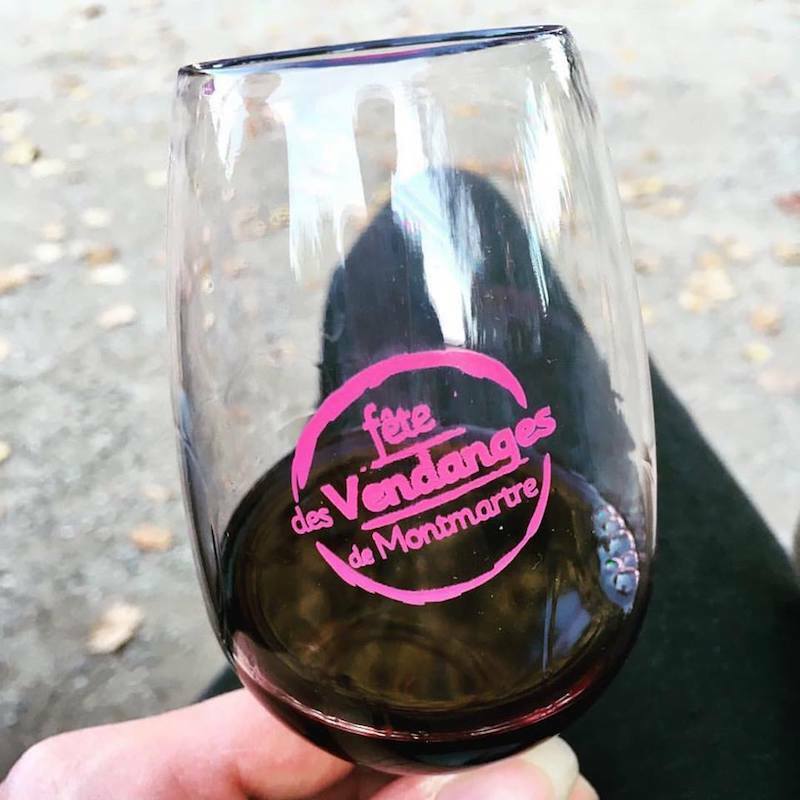 After the complete loss of every single vine in 1928, Montmartre replanted 2000 vines five years later, out of popular demand. A selection of Gamay (used to make Beaujolais) and Pinot Noir were planted. In 1933, “Le Vieux Montmartre” (The Old Montmartre) gave place to “Clos Montmartre” as a peaceful way to limit the ongoing and unstoppable expansion of the real-estate. The first harvest took place in 1934 in the presence of the French president. Since then, the new vineyard keeps growing in the 18th arrondissement of Paris, on the north side of the Montmartre hill (AKA la butte de Montmartre), at the corner of Rue Saint-Vincent and Rue Des Saules. Public access is limited. They only open the gate to the vineyard during special occasions like the “Fête des Jardins” that happens some time in fall after harvest. The vineyard produces a fair amount of grapes. I heard it averages 2,900 pounds each year. The harvest turns into a large and popular celebration near and around the vineyard, with a concert and the traditional parade of the vinous society. Every vintage is baptized differently. In 1999, the wine gave homage to the near by Moulin-Rouge. The wine is then auctioned and the money goes to local charities. 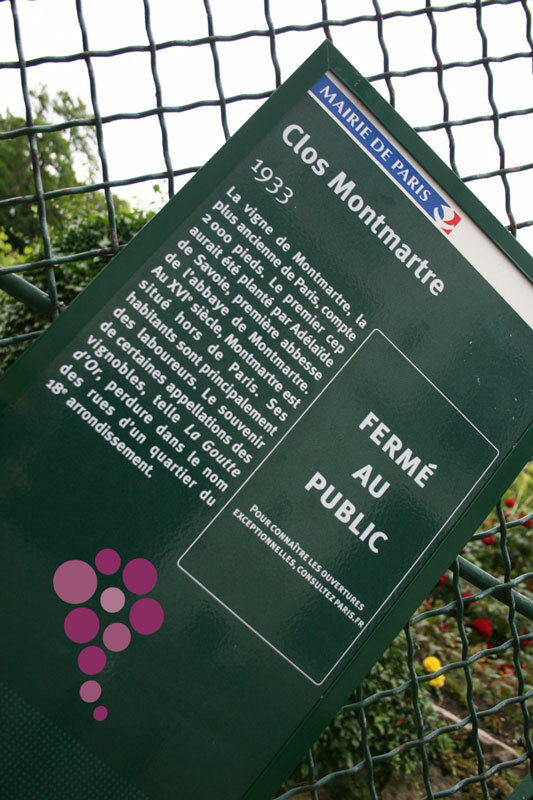 If you would like to visit the “Clos Montmartre”, try to do it in the fall season. You can go to the official website of the City of Paris and get more details as to when the harvest takes place, or send me an email and I’ll try to help you. Note that it changes each year based of grape maturity. Planted in 1983 – 720 stocks of Pinot Noir, Pinot Meunier and Perlette. They bottle the wine in small bottles of 50cl. The produced wine is auctioned to benefit local charities. Planted in 1996 – 350 stocks of Chardonnay and Sauvignon Blanc. This vineyard also grows table grapes which includes Chasselas de Fontainebleau, Muscat de Hambourg, Muscat de Saumur and Sopieta de Frankental. The vineyard of Bercy was planted in homage to a rich vinous past. In the 19th century, Bercy was home to the Court St. Emillion and stayed the largest wine trading location in the world until 1960. Wine was shipped in barrels via the Seine, bottled and stored in large warehouses until being sold to parisian wine merchants and businesses. Planted in 1992 – 165 stocks of some Chardonnay, some Pinot noir and the rest is Pinot Meunier. Belleville was once an important and successful wine-producing district with vineyards covering close to 40 acres. The vines slowly gave place to a more urban style of living. Nowadays, the vineyard produces a Rosé (roughly 160 bottles per year) called “Oeil de Perdrix” which is enjoyed by the locals during the “Fête des Jardins”. The wine is also bottled in smaller bottles of 50 cl. Planted in 1995 – 240 stocks of Sauvignon, Chardonnay, Muscat, Chasselas and Pinot Noir. The Butte-Bergeyre is one of the most secret places in Paris, and offers the opportunity to enjoy beautiful views. This is the only private wine location in Paris. Located in the famous “Bois de Boulogne”, the vineyards total up 400 stocks of various varietals in the gardens of a luxurious hotel. Tours of the vineyards and the cellars can be arranged with the winemaker, followed by the inevitable wine tasting. Located near the remains of St-Germain-des-Prés abbey, this pastoral scene is home to the smallest vineyard in Paris with only 10 vines of Gamay. The wine produced from those grapes is labelled under “Le Clos St. Juliénas”. Behind the church located on the Boulevard des Invalides lies a beautiful rectangular garden with lots of flowers, chestnut trees and some vines. The enclosed vineyard is only open to the public during special events, like the “Fête des Jardins”. • Who Buys French Vineyards? Clos Montmartre. Good article. Thanks. 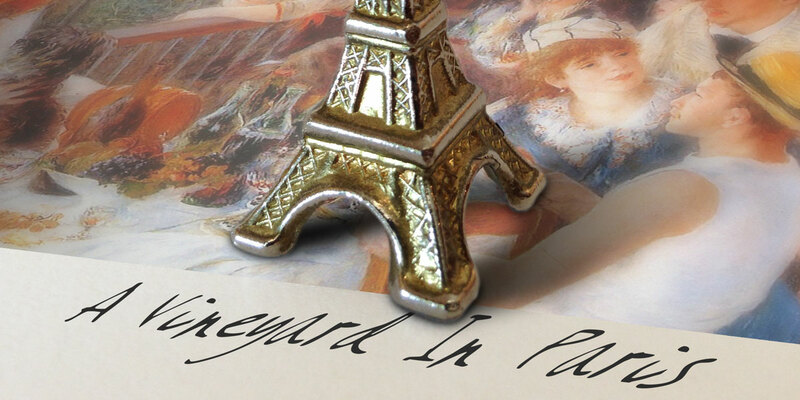 I will be traveling to Paris in late June-early July, and I would love to visit the vineyard. Can you please tell me the times that it’s open and costs? I will be in Paris in September. Are any of these 8 vineyards open to the public? From this page, you will be able to email them and ask specific questions about your visit.